Citizen Kane is a 1941 film, directed by and starring Orson Welles. 1 04 "There's No Disgrace Like Home" Burns' Manor first appears, which is modelled after Kane's manor, particularly the gate with the first letter of the owner's name inside a circle. 2 017 "Two Cars in Every Garage and Three Eyes on Every Fish" The scene where Mr. Burns is trying to be elected as governor in front of a large black and white poster of his own face references a similar scene in the movie where Kane is trying to be elected president. Later, when Burns' election campaign begins to plummit he shouts, "You can't do this to me. I'm Charles Montgomery Burns!" This is a parody of the line that Kane speaks when he fails in getting elected, "You can't do this to me. I'm Charles Foster Kane." 4 061 "A Streetcar Named Marge" When Homer watches the musical rendition of "A Streetcar Named Desire" he becomes uninterested and begins amusing himself by playing with a piece of paper, similar to the way a bored Joseph Cotten does in the theater audience. 066 "Marge Gets a Job" Smithers' dance act for Mr. Burns, Tribute to Mr. Burns, is a direct parody of a dance act organized for Charles Foster Kane in Citizen Kane. 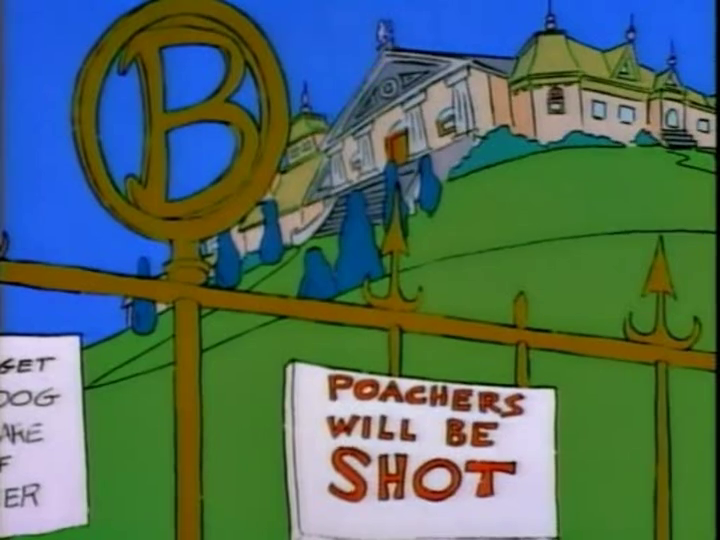 5 085 "Rosebud" The opening shots of Mr. Burns lying near-death with a snow ball in his hand parody of the opening scenes of the film. 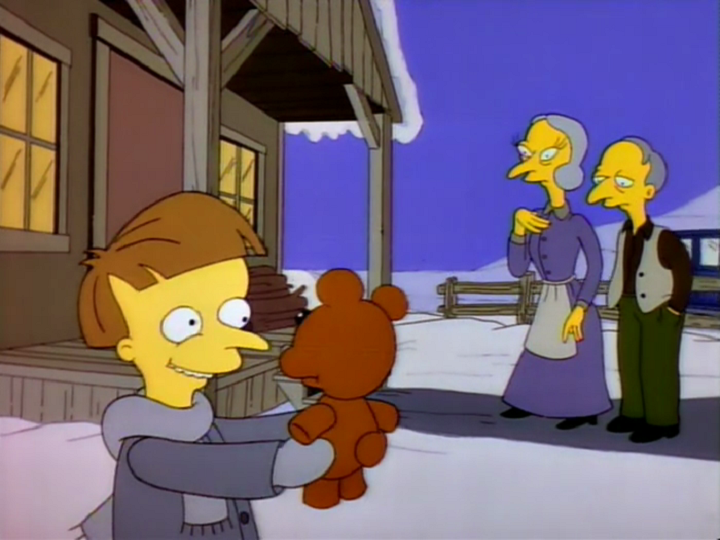 Also, the flashback where Mr. Burns leaves his teddy bear Bobo behind to go along with a rich millionaire and leave his parents references a similar scene where Charles Foster Kane is told to leave his parents for a richer life. Kane then leaves his sled behind. 6 108 "Sideshow Bob Roberts" When Sideshow Bob is elected major of Springfield the black-and-white poster seen behind him is similar to the one seen behind Kane. 7 132 "Bart Sells His Soul" A sled with the name "Rosebud" can be seen in Moe's new tavern, in reference to the film. 8 154 "Treehouse of Horror VII" The third segment is named "Citizen Kang". 11 229 "Guess Who's Coming to Criticize Dinner?" 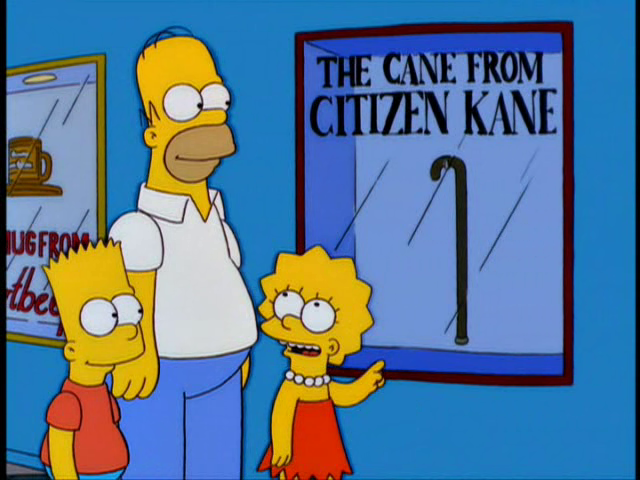 When the Simpsons were in the Mall they see a cane in a glass case and Lisa comments "Oh, look, there's the cane from Citizen Kane", and then Homer, Marge and Bart give each other confused looks and walk off purposefully, leading Lisa to reprimand herself: "Wait a minute... there was no cane in Citizen Kane". 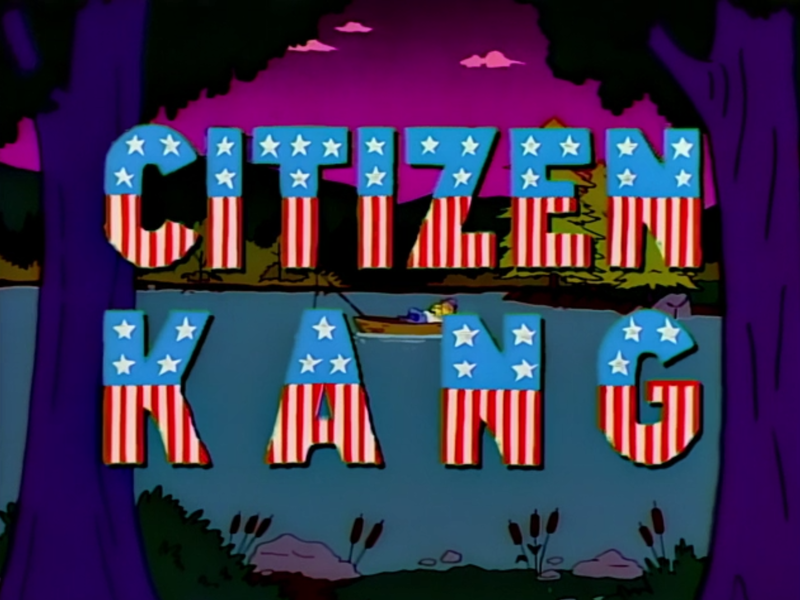 17 360 "Treehouse of Horror XVI" When Orson Welles visits Springfield in 1938 Chief Wiggum threatens him: "... Or I'll kick you in the nose, bud", whereupon Welles mutters "Nosebud", in reference to "Rosebud" from Citizen Kane. 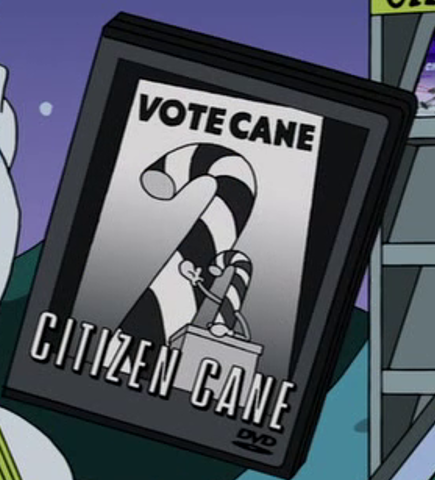 25 538 "White Christmas Blues" Citizen Cane is a parody of Citizen Kane. 29 629 "Frink Gets Testy" In a documentary about Nostradamus, Orson Welles mentions he was the director of Citizen Kane. 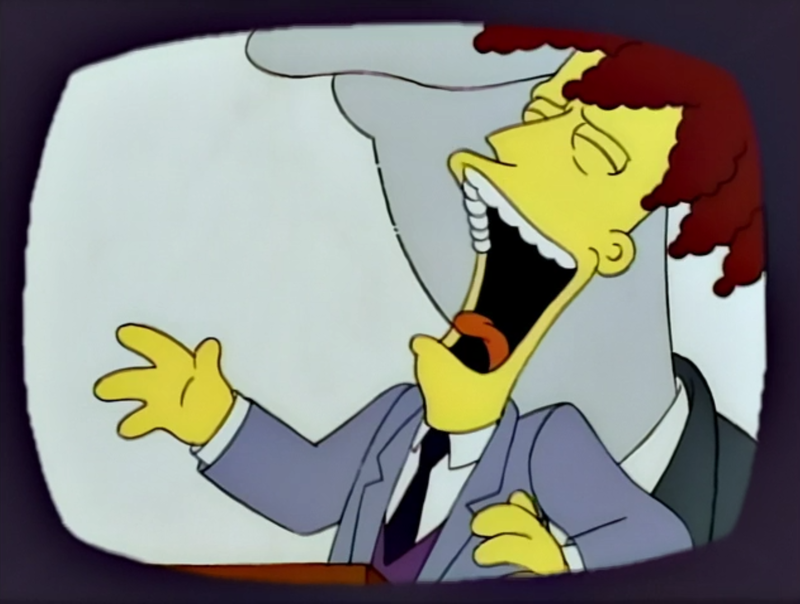 Simpsons Winter Wingding #9 The Radioactive Man Christmas Special! 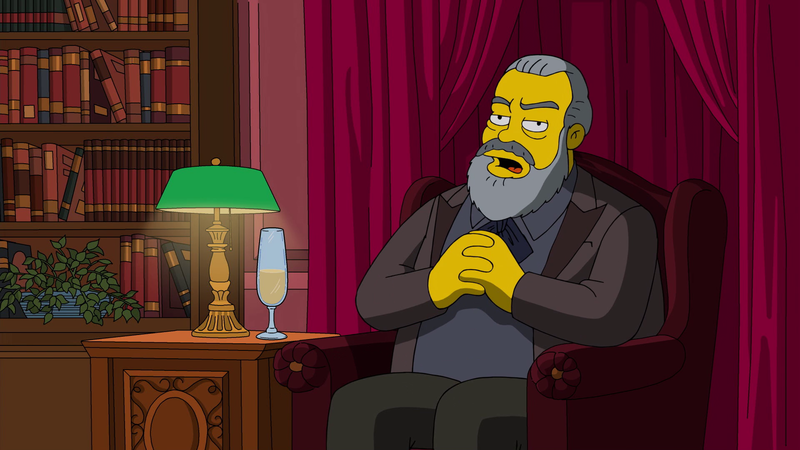 Comic Book Guy calls the The Radioactive Man Christmas Special! so awful at it makes the Ewok Christmas Special look like Citizen Kane. Modified on March 3, 2019, at 07:46.